The NEC PC-8801 is the first computer in an 8 year long series of computers of similar model names. 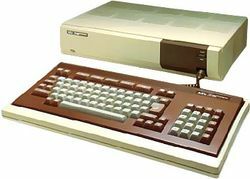 The PC-8801 was a computer system introduced by the NEC Corporation in 1981 and was an early Zilog Z80-based computer. The PC-88, as it is informally called, became very popular in Japan but did not see release in other markets. It was the successor of PC-8001, and offered fine color graphics. It also had an optional MS-Dos board. It was one of the first, if not the first color CPM computer. For its time, the PC-8801 offered a high display resolution, although it could only display 8 out of 512 colors simultaneously and the 640×400 mode was monochrome only. Its sound-producing capabilities were also more advanced than other machines of the time. It ran in three bootable modes: CPM, MS-Dos, and N88-Basic. The N-Basic would natively boot on the system without disk, just like the PC-8001. It also had a software / hardware switch to turn it into PC-8001 mode. Companies that produced exclusive software for this platform include Enix, Square, Sega, Bandai Soft, Hal Laboratory, Pony. Certain games produced for the PC-8801 found shared release with the MSX platform, such as those produced by Game Arts and Konami. Many popular series first appeared on this computer, including Snatcher, Thexder, Dragon Slayer, RPG Maker and Ys. Nintendo licensed Hudson Soft to port some of Nintendo's Famicom titles for the system, including Excitebike, Balloon Fight, Tennis, Donkey Kong 3, Golf and Ice Climber, as well as unusual ports of Mario Bros. called Mario Bros. Special and Punch Ball Mario Bros.. Most notably, they produced for it a unique Super Mario Bros. game entitled Super Mario Bros. Special. The game has since fallen into obscurity, prompting gamefans to call it the "true Lost Levels." Pages in category "NEC PC-8801"
This page was last edited on 2 March 2016, at 02:25.